In the night between the 16th and 17th of February 2015, Anis Abu Shanab dreamt that something bad had happened to his olive trees. 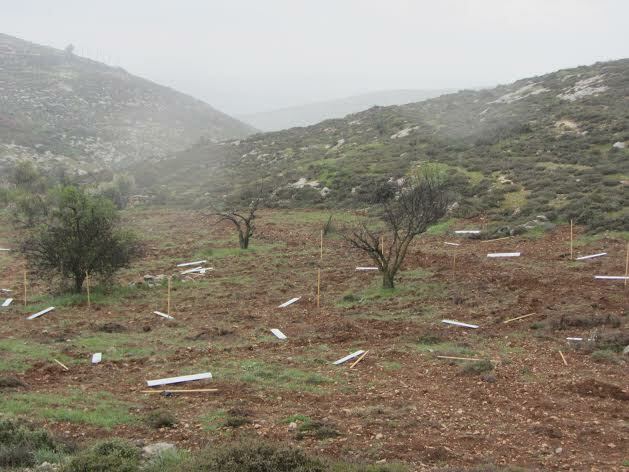 He went to his land on the morning of Tuesday the 17th of February 2015, and found all of the 500 newly planted olives have been uprooted. The 500 olive trees donated by the Joint Advocacy Initiative (JAI) to Abu Shanab and his family were planted by 40 volunteers on Friday 13th of February 2015. Abu Shanab and his siblings own a few hundred dunnums on land that locals call ‘Kanan Al-waslee’. They come from the village of Alshioukh near Asa’ier, north of Al Khalil (Hebron). Abu Shanab lived on this land with his parents in a cave for some of his childhood, and he felt shocked and devastated when he saw the terraces empty of trees in the morning. The family began facing harassment from the Israeli authorities and settlers in the 1990s, but they eventually managed to prove they owned their land with documents from the Ottoman, British and Jordanian eras, which they had kept safe – which is unusual, as most Palestinian farmers in the area rarely manage to find papers to prove their ownership of their land. Their land is surrounded by two illegal Israeli colonies: Beni Kedin and Mazad. ‘Settlers’ from these colonies have beaten members of the family up, and one day Abu Shanab’s brother had to be hospitalised as a result. The last attack on the farmers took place in November 2014. They planted their land with apricots, apples, almonds and other fruit trees, some of which died when they were unable to access their land to look after it as a result of settlers’ violence. This year they decided to plant the land with olives, and they have been working on it for some months to prepare it. Abu Shanab and his family ploughed the land, removed the thorns and weeds, and prepared the soil before planting day. During the day, several of the family members were present on their land, together with JAI volunteers who helped plant the trees. Family members had to park their cars hundreds of metres away, walking the steep rocky terrain before they arrived in their land, because they worry about settlers or soldiers attacking them if they use the road leading to the two colonies, which also leads to their land. At least a dozen heavily armed IDF soldiers were surrounding the nearby hills on the morning of planting day. Shadi, the Durzi IDF commander, approached Anis and warned him in Arabic: “Next time don’t bring with you all these types [referring to the international volunteers], they are trouble. You should only come with your family”. He also told him that he shouldn’t be surprised if his trees were damaged. On their way back to the bus after a day planting the trees, some of the volunteers were nearly ran over by fast-driving settlers who were driving to the colony, and who shouted at them: “Go back to where you came from” in an American accent. One volunteer replied: “You should go back to Brooklyn”. What’s left of the 500 trees are broken branches, cut saplings thrown out of their holes, white plastic covering laid on the ground, and most of the wooden sticks still standing by the empty dug holes. Most of the saplings have been taken from the land which Anis thinks must have taken them a few hours to move. Anis plans to go to the civil administration in Azion to make a complaint, but he said that he doesn’t expect much from them, because “if your enemy was your judge how do you expect justice?”. He will not give up, and plans to work with the JAI to plant his field again.